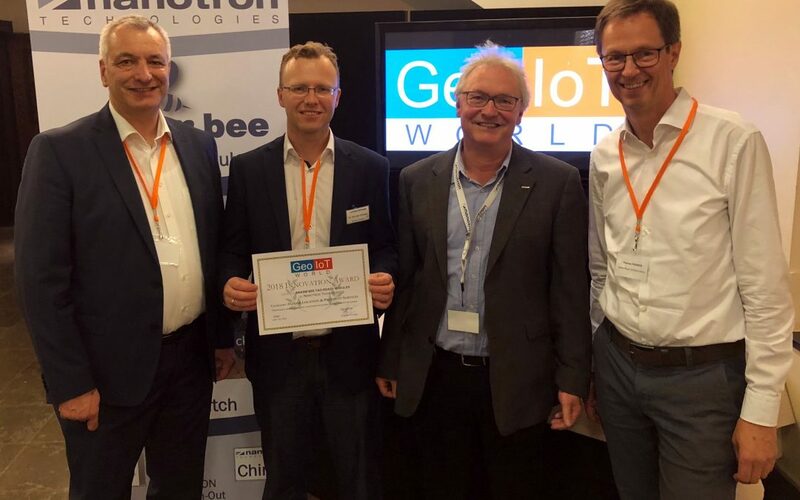 Nanotron wins Geo IOT World award for indoor location and proximity services | Location Running. 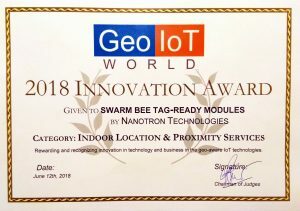 BERLIN, Germany, June 13th, 2018 – Nanotron Technologies GmbH, a leading provider of location awareness solutions, announces its swarm bee family of smart RF modules have received the award for best indoor location and proximity services, at the awards ceremony yesterday at Geo IoT World in Brussels, Belgium. Nanotron’s swarm bee modules are the first and only common platform for both UWB and Chirp technologies, thus providing the capability to mix and match UWB’s short-range cm accuracy, and the longer range of Chirp meter accuracy with the exact same form factor and application programming interface (API). Location solutions powered by swarm bee in underground mining applications are improving safety, increasing productivity and driving compliance. This is achieved with concurrent support for exclusion zone detection, collision avoidance and highly scalable tracking. Swarm bee reacts ultra-quickly to any approaching vehicle or item that reaches a pre-set distance. It supports 10 cm precision at up to 50m range, plus 1m precision up to 500m range for any combination of proximity and real-time tracking applications. By providing tag-readiness, one common API and one common pin-out, swarm bee modules reduce time-to-market for location-aware products by 12 months, compared to handling RF design in-house. Geo IT World explored location-aware IoT opportunities, with a conference featuring more than 50 speakers, and a highly focused exhibition and more than 250 attendees. For more information, see https://www.geoiotworld.com/emea/ and https://www.geoiotworld.com/emea/awards.